This heart unity candle involves a little construction and support techniques, but once the heart foam is in place it is very simple to flower in. 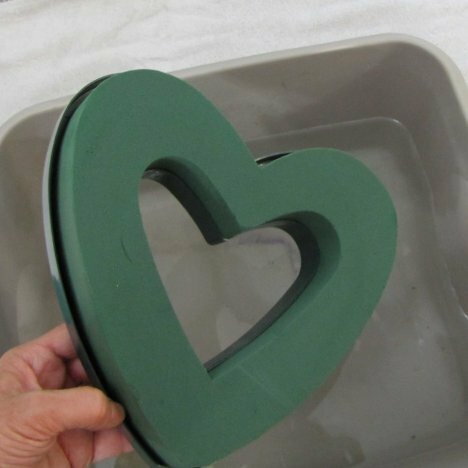 First you have to soak the heart florist foam form in water that has been treated with a professional flower food. Allow to foam to absorb the water naturally, without forcing the heart under the water. 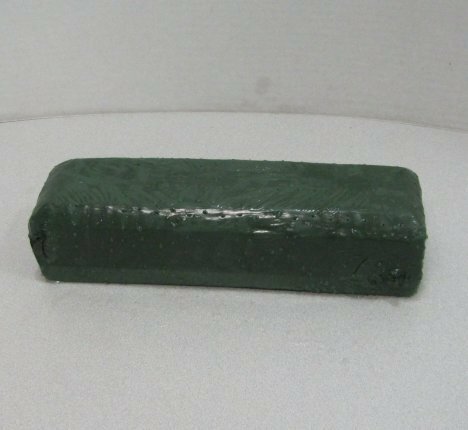 This could cause dry pockets in the foam, which could harm any flower stems inserted in that portion. 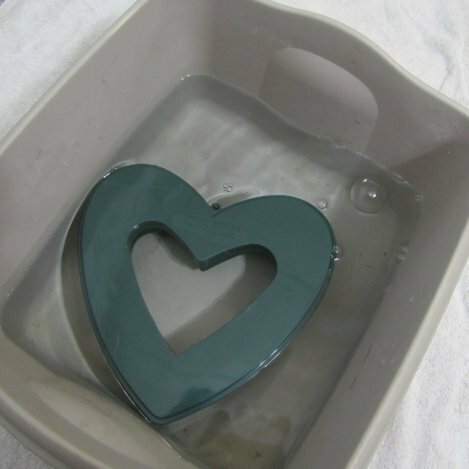 The plastic back will not allow the heart to sink completely, so the heart must be placed foam side down in the water tub. 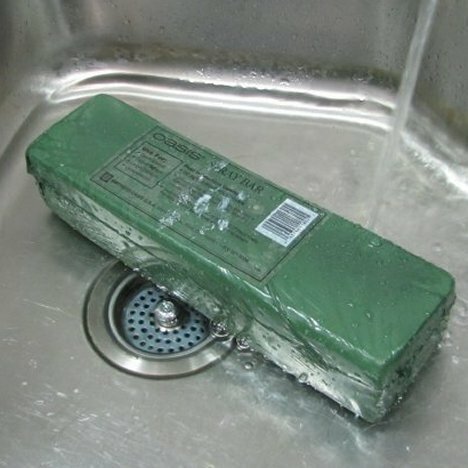 It will be very heavy with water when fully saturated. 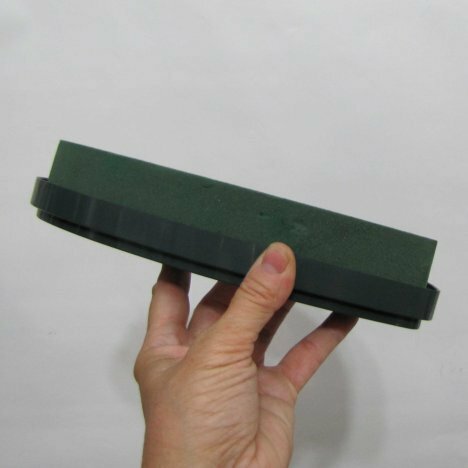 Note the deep side edge of the foam. 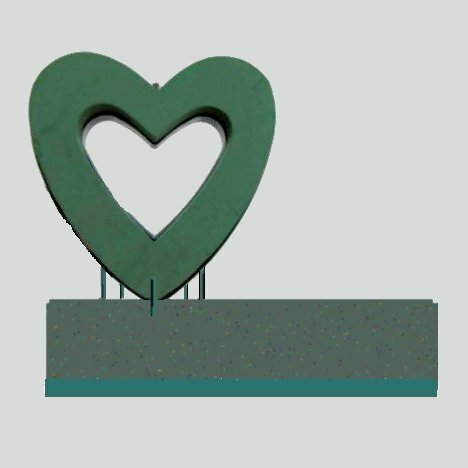 Cowee stakes will be inserted upward into the bottom edge to support a standing heart on top of the spray bar. These wooden stakes are very porous, which means they will swell as they get wet and creates a tighter fit in the wet foam. I still use florist adhesive to ensure the stakes stay in place. 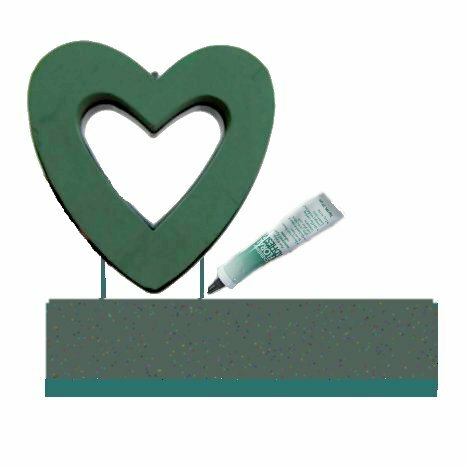 Allow the spray bar to soak up water as in the same manner as the foam heart. The spray bar has a built in tray on the bottom, making it unnecessary to use a container for this foam. It is wise, however, to place a protective film or mat underneath the spray bar if placed on a wooden surface. 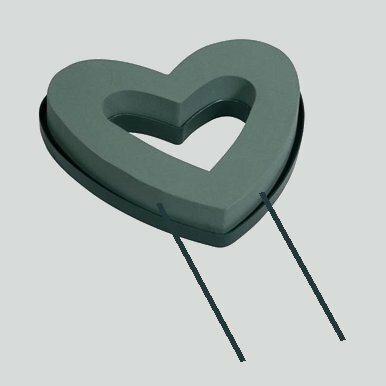 Insert the heart with the Cowee stakes into the top of the spray bar. Insert more stakes both in front and in the back of the heart. This is needed to stabilize the heart in an upward position. The stakes in the back (the plastic portion) can be longer and use waterproof floral tape to secure the back stakes to the heart. 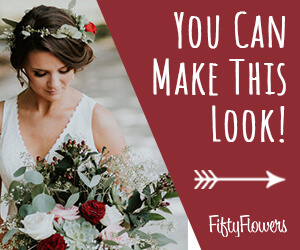 After insertion, it would be advisable to use floral glue to be sure the stakes do not come loose during transportation or placement at the ceremony venue. You want to be sure your mechanics are solid to prevent the heart tipping over, which could dislodge the placement of the heart. 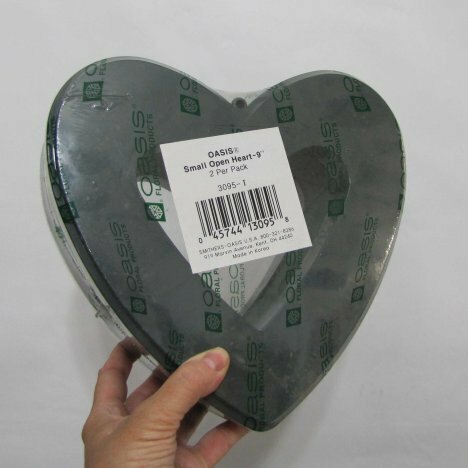 You can make the design even more secure by wrapping waterproof tape through the open heart and down and around the spray bar several times. Once you are confident that your mechanics are solidly in place, you can move on to the next step.